Spend a day of discovery exploring two floors of fascinating interactive exhibits at the Museum of Discovery and Science! See sharks and the largest living Atlantic coral reef in captivity, hang out with bats, be charmed by a 12-foot snake, plus pet alligators, turtles and iguanas. Test your pilot skills in nine cockpit simulators and learn about Florida's amazing Everglades in the Living in the Everglades exhibit. Discover our place in aerospace at Runways to Rockets, our space exhibit, and take a simulated trip to the Moon or Mars. Make it a play date at the Discovery Center, designed especially for children under seven. Bring the entire family for a day of exploration. Take a ride on the Everglades Airboat Adventure, enjoy the playful antics of river otters, experience hurricane force winds in the Storm Center, dig for fossils alongside a giant megalodon shark, and see exciting science theater shows. Don't forget to check out the Explore Store where you'll find lots of educational and intriguing games, toys and books and other unique gifts. 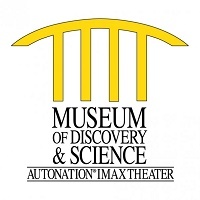 At every turn, the Museum of Discovery and Science invites you to discover the scientific wonders of this world and beyond! Exhibits Admission for 2 Adults and 2 Children (ages 2-12). Children 1 & under are free. Hours: 10 a.m. to 5 p.m. Monday - Saturday and 12 noon to 6 p.m. Sunday. Includes admission to museum exhibits only. IMAX® tickets may be purchased separately. Can not be combined with other discounts or special offers. Not valid for special events.